Looking for a modern wall clock? Shop the George Nelson Vitra Wall Clock Collection from Stardust. Designed in the late 1940s through the late 1950s during a huge U.S. economic boom, George Nelson's vision was to bring modern design into common aspects of the home. Our fully authorized re-edited Nelson clocks are manufactured and distributed by the Vitra Design Museum, Germany, using original models and documents from the George Nelson archive. They are authentic and are manufactured under license of the George Nelson estate. 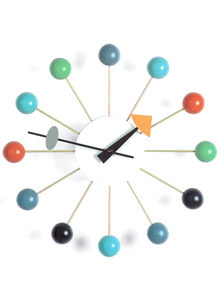 Our collection includes George Nelson design classics such as his Ball Clock, Sunflower Clock, Eye Clock, Spindle Clock, Sunburst and Flock of Butterflies, all manufactured by Vitra in Europe. George Nelson (1908–1986) was an American industrial designer and one of the early pioneers of American Mid-Century Modernism. George was more than a product designer. He was an icon of the modern movement. He was also a key figure of American design, together with the likes of Charles and Ray Eames, Isamu Noguchi and Alexander Girard. With nearly 50 years of designing, he created and promoted a remarkable collection of modern home furnishings including furniture, lighting and clocks. From 1946 onwards Nelson ran his own design office, creating products that are now regarded as icons of mid-century modernism like the Ball Clock (1947), the Bubble Pendants (starting in 1952) and the Night Mantle Clock (1984). Shop the midcentury modern style at Stardust.